Some details regarding the successor to upcoming Broadwell CPUs, codenamed Skylake, have emerged with the leak of an alleged presentation slide. Intel’s future CPUs are to feature an all new architecture and a new socket, moving from 1150. Additionally, it will bring DDR4 memory support to the mainstream market, as well as PCI-E 4.0 for increased graphics and system bandwidth. In addition to a new architecture and support for new memory and I/O bus, Skylake should bring new instructions to the table. The AVX3.2 instruction set will build on current AVX2 and will bring enhanced performance for optimized programs. Furthermore, the rumor wants Skylake could implement some level of memory unification for CPU and built-in GPU, just like AMD hUMA (heterogeneous Unified Memory Architecture) that will debut later this year. Memory unification should simplify the use of graphics processing engines for general purpose applications. Intel’s Skylake parts are set to be built on 14nm, a manufacturing process that is the new logical step after the 22nm node which is being used for a second series of CPUs with Haswell. 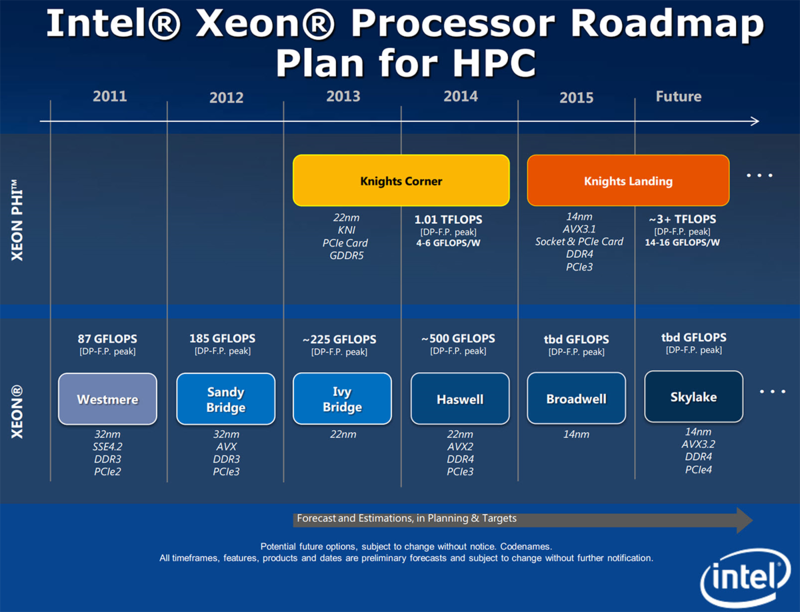 The new process is expected to debut in 2014 with a possible Haswell refresh. It will therefore be a mature process by the time Intel introduces its new Skylake architecture, moving along with the company’s “tick-tock” product strategy. I think there is a typo there. It should say AVX3.2 instead of AVX2, and AVX2 instead of AVX, as Haswell already has AVX2 support. You're right, it is a typo. Skylake will implement AVX3.2 instruction set. Slide has errors in it, lol. PCIe3 came with IB, SB was all PCIe2. And Haswell (Note: not Haswell-E) as DDR4. SNB-E was capable of running PCIe 3.0, but not specifically certified for PCIe 3.0 by the PCI Special Interest Group in time for its release. So while it couldn't technically be called PCIe 3.0, it's basically running PCIe 3.0. Looking at it again, it's talking Xeons, not desktop. That's what makes the difference, SB-E Xeons are rated for PCIe3. Sooooo, this slide means nothing for desktop use. PCIe 3.0 couldn't be properly tested for compliance when SB-E was released. So Intel couldn't say/market that SB-E was PCIe3.0 compliant, although the CPU has native PCIe3.0 support. Some desktop X79 motherboards allow PCIe3.0. EVGA does on some BIOS, looking at HWBot. TiN and Vince have PCIe. Nobody else I ran across. I'm surprised Intel hasn't gone back and gotten it certified. Probably because it isn't a big deal since most cards don't fully saturate pcie 2.0 yet. Only real advantage is that pcie 3.0 x8 won't bottleneck most cards last time I checked.